In 1857 the native troops of the Bengal army rose against their colonial masters. The ensuing insurrection was to become the bloodiest in the history of the British Empire. Combining storytelling with detailed research, Saul David narrates a tale both tragic and compelling. He provides new evidence that the true causes of the mutiny were much more complex, and disturbing, than previously assumed. 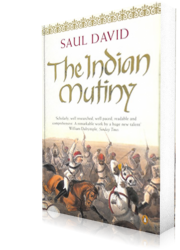 A remarkable work of synthesis: scholarly, well researched, well paced, readable, and comprehensive… The Indian Mutiny is one of history’s great stories, and in David it has found a chronicler whose knowledge and grasp of arcane military matters is matched by his narrative skills. A fine achievement by a huge new talent. Saul David has written the 21st Century version with a brilliant display of literary history that escapes the word “definitive” only out of deference to its inexhaustible subject matter. Enthralling… David tells the story of the mutiny’s violent course and final suppression with almost cinematic vividness and sweep.